A U.S. congressional committee heard complaints Tuesday that USAID programs are at risk of getting "slashed" or "eliminated" under the proposed budget from the White House, during a time when the threat of famine in East Africa is the "highest it has been in decades." At the hearing of a House Foreign Affairs subcommittee, panelists warned that U.S. budget cuts could undermine efforts to address the consequences of drought and a crisis-driven famine at a time when aid agencies are attempting to scale up efforts to prevent millions from dying. In prepared remarks submitted to the committee, panelist Faustine Wabwire, senior foreign assistance policy adviser for the Bread for the World Institute, said the proposed budget cuts risk "slashing or eliminating the very accounts that finance the U.S. government's emergency response," including Food for Peace, International Disaster Assistance (IDA), and the Migration and Refugee Assistance account. 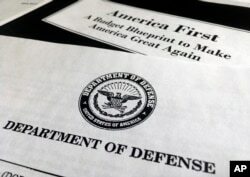 FILE - A portion of President Donald Trump's first proposed budget, focusing on the Department of Defense, and released by the Office of Management and Budget, is photographed in Washington, March 15, 2017. "We know that the administration has proposed about 30 percent cuts to the State Department and USAID and from what we know the role of these institutions these will definitely have negative implications," Wabwire told VOA on the sidelines of the hearing. Panelist Matthew Nims, acting director of the Office of Food for Peace at USAID, told lawmakers the president's blueprint does not specifically mention cuts to his office and that he cannot measure the potential impacts of the proposed budget cuts. "I feel that it is my job to make sure that with the resources we are given by Congress as it goes through that we make the tough choices that are going to be there in the future and that we continue to stress the most vulnerable and the most needy in the world," Nims said. The Famine Early Warning Systems Network reports an estimated 70 million people in 45 countries will need emergency food assistance this year. FILE - Yemeni children receive free food donated by Yemeni volunteers during the holy month of Ramadan, in Sanaa, Yemen, June 11, 2016. Famine has already been declared in South Sudan, and more than 20 million people are at "credible risk" of famine in Nigeria, Somalia and Yemen over the next six months, according to the U.N. Office for the Coordination of Humanitarian Affairs (UNOCHA). The Food For Peace program, established in July 1954, provides emergency food aid and development food assistance to tens of millions of people in dozens of countries each year, according to its website. 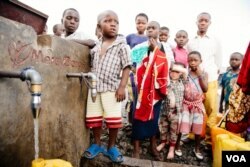 The USAID program receives most of its funding through the government's Title II Grant, which administers both emergency and development resources. FFP's other major source of funding is the International Disaster Assistance account (IDA) which allows FFP to buy foods locally, regionally and provide voucher programs and market based interventions. Panelist Michael Bowers, Mercy Corps vice president of Humanitarian Leadership and Response, advised lawmakers to fully fund IDA and Food for Peace, adding that is one step Congress can take to help prevent the spread of famine and create conditions that mitigate food crisis. "If we fail to respond now, we risk a much larger and costly emergency response later with too many lives lost in the meantime. Although funding is also needed across the region we are barely scratching the surface with what we have," Bowers said. Subcommittee chairman Chris Smith told VOA after the hearing that he is unhappy with the president's budget blueprint as it stands, adding that he does not like the big cuts and his goal is to "get it right." "There's crises everywhere and we need to do more to help people in need," Smith said. "The world is in crisis, there are humanitarian needs, the number of people of concern to the UN High Commissioner for Refugees is at an all-time high." UNOCHA says more than $5.6 billion is needed to prevent a major humanitarian disaster of that amount, only about $1.2 billion has been committed.